Looking for a nice jewelry template for WordPress? - SA Designs Unltd. Looking for a nice jewelry template for WordPress? 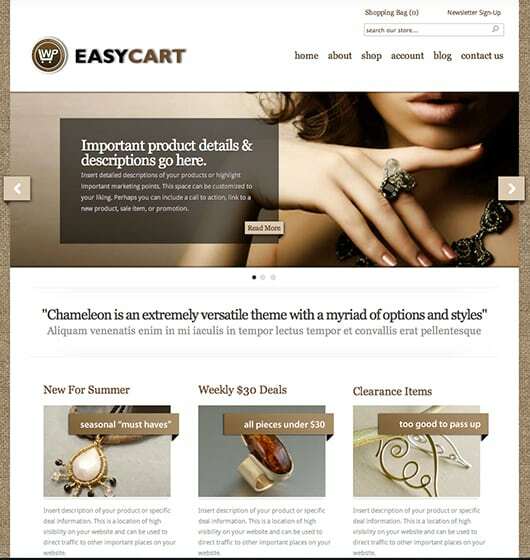 Check out Chameleon on WP EasyCart. Our Chameleon template is great for showcasing and selling your jewelry. https://www.sadesignsunltd.com/wp-content/uploads/2013/09/chameleon-thumb.png 324 845 admin https://www.sadesignsunltd.com/wp-content/uploads/2018/05/sa-designs-logo.png admin2013-09-08 12:26:342017-10-05 14:31:33Looking for a nice jewelry template for WordPress?